My stack of new shirts made me happy like springtime. No one else wanted these? They only cost 50 cents on thrift store super-markdown. I congratulated myself on the new Pima cotton and ocean-y colors. Perfect! This morning, between bites of cereal, Andrew asked, "Hey Mom, how come all your new shirts say SAMPLE on the back?" I wonder how many other people saw that first? I had only been wearing them ALL week! What was your worst thrift store mistake? It's okay--we all have them! New to your blog but I enjoy it. Sounds to me like a great art project for the kids. Some fabric paints and some love, there you have it, masterpieces of love! Oh, Dear! Or how about appliquing some piece of pretty fabric in a coordinating pattern/color? Oh dear! Would you be able to fix them so you can still wear them? What about decorative patches? Soaking them in vinegar may help get rid of that dye... But not always. I once bought a set of dishes that looked pretty in the bag, but when I puled them out they were the cheapest kind of china. They are still in my cupboard all scratched and discolored, because I haven't found anything to replace them yet. definitely made the mistake of not trying on - not so much a size issue, but a "does this have all the buttons and zippers and snaps that it is supposed to so as to avoid a wardrobe malfunction" issue. I guess you can always save them for cool weather and wear them with a cardigan, or blazer. Just don't take it off! If you can't remove the inked 'sample' marking, and choose to make the soft cotton into rag rugs or face cloths, DO SAVE those collars and cuffs! The last time I sewed a t-shirt up to match some shorts, I paid $4 just for the color and cuffs on sale from the notions wall at JoAnn's! From that experience I vowed to look for the equivalent when thrifting and have a nice stash of sewing notions now - including terrific buttons and like new zippers! My worst thrifting mistake - judging a box by it's label! I bought a 'new in box' mini crock pot -super cute- I didn't check it out because it was all sealed. It turned out to be the old food encrusted cracked crock pot that I assume the new one pictured had replaced. Creative tapework fooled me! Thankfully, it was returnable! Yeah, applique or paint might work...if the SAMPLE wasn't printed right on the bottom back half, or what I call a very unflattering place! Thanks for the ideas.Maybe I could do something cute for Elise from them. You could wear a sweater over them until it gets too warm! Oh, gosh! That just made me laugh so loud I woke up the cats! I don't shop at thrift stores enough to have made many mistakes. I did buy a couple of Guideposts books about animals for $2 each (they're hardbacks). They're really badly written. I can't handle bad writing, so it wound up being a poor purchase. The other mistake is in what I didn't buy. I found a Denby Harlequin casserole with lid for only $5. I should have bought it for a gift for my friend who has that dish pattern, which is now discontinued. I'm still kicking myself over that one! So a freezer paper iron on painted shirt. Easy and fun. And you can do any design you want to cover it up. A row of flowers or even some cream star fish would look good with that color. If you try something like Stain Stick it should get most of that out with repeated treatment and washing. Of course I'm not sure how much the price of your $0.50 shirts goes up that way. :) I used to get samples at work a lot and the stamp would eventually come out. I dont shop thrift stores much but I have to say that I had to laugh at your shirts. How hilarious! Oh, Meredith! I'm so sorry! Oh, that made me laugh so hard I woke up the baby. Too fun!! Sorry for laughing, but this was funny! At least you only paid $.50 for the skirts. I have purchased a few thrift store items for much more only to find a serious defect once I got home. cut a large motif from the design and applique it on the top. Or, if the pattern doesn't have something like that, make a flower or other applique featuring the fabric. Then, cut your 'sample' off and, using the cute fabric, add a dirndl type skirt to the bottom of the shirt. If it is on the back, I would throw a cardigan over it and no one would ever know! Yeah, I make mistakes all the time! Recently? That couch we built is HUGE! Thankfully the room is big enough to handle it, but at first glance -- WHEW! Oh, Meredith. That makes me laugh really hard. I have read before but never commented.... That is too cute and to think all those nice people who didn't come up to ask What the sample was of! P.S. Is it wrong to take a crockpot to Goodwill that has a lid that doesn't fit well, which is why I don't want it? Don't know what else to do with it and don't want to "trick" anybody! Ha! Well, maybe you are a trendsetter :) All of a sudden, you are going to see all these people walking around with that stamped on their back because you are such a fashionable gal. So funny! That is sooo something I would do! I'm lousy at thrift store shopping. I always start out feeling really great about my purchases, but over time I find that I bought the scratchiest shirt on planet earth, or that there's a hole here or a bleach spot there. Last time I went, I found a great new purse. At least I thought it was great until I got it home and showed my husband. He gave me a look like "I'm checking your eyes to see if you're joking or not". I took the hint, and offered it to my girls for a play purse. "it's too...ugly...mommy" was their response! 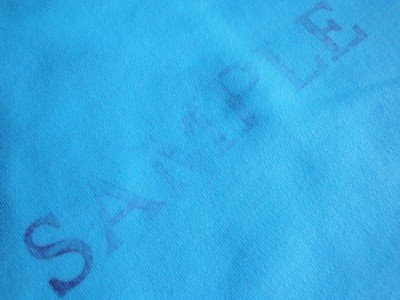 "SAMPLE STAMP – Blot with rubbing alcohol and cotton balls." It wouldn't hurt to try! HOT, HOT, HOT water enough to cover the clothes. Soak at least overnight and launder as usual. If soaking in the washing machine, run the machine past the agitaor cycle, then stop the machine for the night. I have removed MANY stains this way and made a nice profit off of cheap clothes. I'm still trying to find clothing at thrift stores! I don't know what it is..I can find tons of houselhold items and books...but I never seem to find these incredible deals that others do. Some women I've read about dress so gorgeously for pennies! My pastor's wife does...she shops thrift exclusively...and looks fabulous! Her style is a lot different than mine...she's pretty fancy and I'm...uh...not...lol! Anyway...I'm SURE you will come up with something BRILLIANT to fix the sample problem...you always do! I'm sorry but that made me laugh out loud! Wow! They will make good layering pieces I guess and good lounging at home shirts. Oh, dear .. try soaking it in some rubbing alcohol to see it that does the trick ... I also second soaking it in dishwashing detergent. I was thrilled to find directors chairs covers. Even though the bags were open, I didn't check too closely. They were only the tops with no the seats. Ooops! I bought this cute, 3 drawer/cotton laundry organizer thing. Love it. I get it home and the dog is going bonkers! She won't leave it alone and is crying and pawing it. So I lean in to investigate. It was at that point the smell of cat pee sent me into a long round of dry heaves. or draped shoulders cover up SAMPLE !!! I've made some mistakes, but nothing quite as funny as yours! I usually put my mistakes into a big box and donate them to Goodwill. I have this nagging thought that someday I will actually buy back those same items from Goodwill! You know how you look at something and it looks kinda cute and yet vaguely familiar?? Surely you can find a family with the surname of Sample and make them very happy . . . .
My worst mistake was a Limited sweater (I think about $4-5) that was so short it ended up being a crop top on me. Right into the giveaway pile it went. You are just being trendy with out knowing it. T-shirts with saying on them are very "in". You did it on purpose! LOL! I picked up a pair of cute shoes at a thrift store once. Wore them to a church function. The sole started falling apart in great chunks while I was walking around in them. I haven't had the nerve to buy a second-hand pair of shoes since. I have had my share of thrift store dud purchases. The worst was buying a clay cooker, and paying more than I really wanted to, but I had looked forever for one. When I got it home I realized that it was cracked. I was really bummed. I wanted to suggest that you try hairspray, rubbing alcohol or WD-40 on the stamp. I have used WD-40 to remove many stains like that. There is also a product by Goo Gone called InkAway that removes ink stains from fabrics. It works pretty good and last a long time. Meanwhile, wear a sweater. Good Luck. Okay, that is one of the funniest things I read today! but truthfully I don't buy clothes for myself at the thrift store. We get hand me down bags. Truth is that likely many didn't even see the words. Thanks for the giggle, and the camraderie Meredith. No sample stamps for me but plenty of missed stains & holes over the years. A close one was finding a chenille bathrobe of the fitted Hollywood style that I've wanted for ages, trying it on over my clothes and taking it to pay--only when cashier held it up to fold into the bag did I see the interior marks of an "accident"--and not something that has been washed out but left a stain behind.